Held at YMCA Camp Jones Gulch. San Mateo County 4-H camp seeks to promote an environment where children learn leadership, grow their personal self-confidence through trying new things, and feel part of a safe family - enduring themselves to the unique and special 4-H camp traditions. 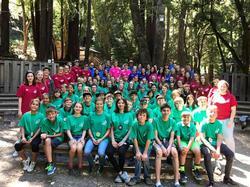 San Mateo County 4-H Summer Camp offers a week of fun and excitement including swimming, boating, archery, arts & crafts, hiking, rock tower climbing, and both organized and group games. We have fun nightly recreation, which includes all campers in the activities, is a big hit, and facilitates positive youth interactions. The friends and memories made at camp last a lifetime. 4-H offers hands-on, experiential learning activities to promote citizenship, leadership, and life skills. Throughout summer camp, each camper has the opportunity to become a leader by getting involved and potentially becoming camp staff! For those who do not want to become camp staff and move up in camp leadership; don’t worry – there is a lot of fun to be had for all! Age requirement: Must be 9 yrs old to 19 yrs old by July 1, 2019 to participate.